In our conservatory we offer both basic studies of music for children with more of a hobby approach, and vocational upper secondary qualification of music. Additionally you can go in for band activity in a band workshop. All teaching is offered in Finnish only. In music playschool, pre-school kids get a weekly group lesson. The tuition fee is 120 € (+ 10 € for registration of a new student), and in musical instrument playschool the tuition fee is 180 € (+ 10 € for registration of a new student). After music playschool, kids can pursue musical instrument training. In this training, in addition to a weekly group lesson, students, aged 7-9, participate in instrument lesson once a week in a group of four students. Tuition fee is 260 € (+ 10 € for registration of a new student). After that, in the basic part-time music studies (for 10-26 years old), theory and group lessons are combined into one unit and it’s held once a week by the same teacher. Along with the weekly lessons, students will have one private instrument lesson per week. Tuition fee is 340-380 € (+ 10 € registration of a new student). In addition to tuition fees, students of instrument training and basic part-time studies must pay an extra fee every semester. The amount of the extra fee depends on their home town. The inhabitants of Helsinki pay 25 euros extra fee every semester, while inhabitants of other towns pay the amount of 336,40 euros extra every semester. The extra fees are different because Helsinki supports the Conservatory financially, the other cities do not. In music playschool and band workshop there is no extra fee, only the tuition fee. NOTE! In case the student takes a break or cancels in the middle of the term, the tuition fee and the extra fee are non-refundable. Participants who have been enrolled in the band workshops (for 6-12 olds) will also be studying some basics of band playing in the group lessons. There won’t be any separate theory studies or private instrumental teaching in the band workshop. Other courses of the open department are available for enrollment at the beginning of the semester. Tuition fee is 180 € (+ 10 € for registration of a new student). Children have a natural ability to search and find new ways to act more creatively. At the Pop & Jazz Conservatory, we want to support through musical education this intrinsic creativity from a very young age. Interaction, learning by hearing, and creative expression are essential for rhythm music. They together form a base for the rudimentary education of rhythm music. Living through music in a daily basis is important—every experience is valuable! Students will be taken in to music playschool in an enrolling order. Only new music playschool students can be enrolled via the website. Old students who want to continue studying fill out a form they have been given by the teacher. Kids under 10 (7-9 years) belong in the musical instrument training in the Pop & Jazz Conservatory. Musical instrument training includes a music workshop lesson (45 mins) once a week in a group of 8 students, and group playing lesson (45 mins) with a total of 4 students. In the workshop, students learn musical aspects together by singing, playing (rhythm, percussion and band instruments), composing and moving around. In case the child finds his or her musical instrument during those years he or she can start studying already before turning 10. The weekly group lesson will be either music workshop or pre-vocational qualification (it reminds more of a normal band than the band workshop does). If the instrument is one of the following: flute, clarinet, percussion instrument, trombone, saxophone, bass guitar, electric guitar or trumpet, studying can be started straight away without the suitability test. If the instrument is drums or piano, the student needs to sign up for the suitability test. This test will play an important role for the student to be chosen. There are empty spots continuously for all the other instruments aside from drums and piano, that is why the test needs to be done. One can apply to the musical instrument training yearly through the entrance examinations (application time in April, entrance examinations in May). Musical instrument training (music workshop & musical instrument experiment) is included in the advanced syllabus of basic studies. Band workshops are groups were you learn the basics of group playing. In every lesson there will be body rhythmic, singing and playing. Kids can try new instruments such as bass guitar, drum set and guitar; it’s almost like being in a real band! There will be no private instrument teaching, the learning happens in the group during the lesson. Some of the kids may have some knowledge already of playing Finnish zither, piano, recorder flute or something else. These instruments may be needed sometimes in the band workshop but knowing how to play them beforehand isn’t necessary. In the workshops everyone can try different instruments. The instruments may change also during the lesson often so the kids won’t need their own instruments just yet. They will practice rhythmic and singing while playing the instruments. Band workshops are meant for “old” music schoolkids and for the new ones who applied for the musical instrument training. It is a good alternative to take an interest in playing music once a week (in the training there is group lesson and playing lesson). All the children 6 years and older can participate in a band workshop. The size of the workshop group is 5-8 kids. Vocational upper secondary qualification of music (180 competence points) is meant for students who want to graduate as a performing musician or in music technology in the field of rhythm music. The students of the Pop & Jazz Conservatory vocational education have to master some skills in both verbal and written Finnish language, we do not offer a full English program! Check our school’s interntaional festival promo video and the international student artists that performed at our festival. Our conservatory is a member of international organizations Berklee International Network (BIN) and International Association of the Schools of Jazz, and cooperates with several members of them. The conservatory is situated in Helsinki at the same building than the Metropolia University of Applied Sciences Degree Programme in Music, which gives higher education. The Helsinki Pop & Jazz Conservatory’s shared facilities include 80 classrooms a 24-track recording studio and a 250-seat concert hall. Annual music festivals in the spring and the fall feature students and visiting musicians. The Helsinki Pop & Jazz Conservatory was established in 1972. 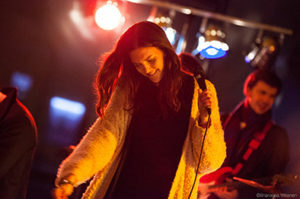 The 45-year-old school offers a two-to-three-year vocational program in the Pop/Jazz Musician and Pop/Jazz Music Technology. 30-40 vocational students are enrlolled every year, adding up to total 120 students. The Helsinki Pop & Jazz Conservatory is subsidized by the Finnish government, so the vocational students study free of charge at our school, also students coming from outside of Finland. The only thing is, the student has to master some skills in both verbal and written Finnish language, we do not offer a full English program. 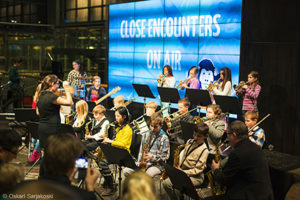 Dream On Big Band was formed in 2014 and it consists of pupils from six elementary schools from Eastern Helsinki. The band is conducted by Jasmin Afaneh-Haanpää and Mikko Haanpää and the band will feature the internationally acclaimed trumpet player Verneri Pohjola at their concert at Sanomatalo. Additionally, our school provides basic education in music for around 1000 children (part-time studies for children). The conservatory employs more than 80 teachers, half of whom teach full time. Modern and innovative teaching methods make the school Finland’s leading institution of rhythmic music.